During my recent presentation on “Transforming Textbook Activities into Spontaneous Speaking Ones,”, I polled the audience of modern language teachers to find out how many created or found additional material for their textbook. Over 90% of the audience raised their hands. These language teachers had textbooks from various publishers; the teachers represented many different languages and different levels of learning. These teachers commented that a textbook is just a tool. It is not the only tool in a teacher’s repertoire. Other tools are better at certain times. Just as a carpenter would not use a hammer to saw wood, teachers understand that each tool has its unique purpose. They select their tool for a specific learning purpose. In addition, when teachers use different tools, they add variety to the classroom. Many foreign language teachers use video tools such as YouTube to show a real life example rather than having students just look at the printed word from the textbook. For example, a Spanish teacher may show a YouTube video of people at a hospital emergency room in the target country, have their students identify the basic emergency room vocabulary, and, then, have the students role play an emergency room conversation based on watching the video with no sound. The static textbook tool cannot duplicate the actions of real people from a video tool. Many modern language teachers incorporate outside readings or current cultural events that are not in the textbook. The textbook chapter done in December may deal with common foods but not with foods unique to the cultural celebrations that occur in the target language country at that time. Students who only use a textbook tool could go through the whole year without ever learning about the current celebrations / activities in the target language country. Many foreign teachers try to engage their students in conversations that go beyond the limited ones in the textbook. The teachers may use the tools of objects (authentic cultural items from the target country), pictures from the target language area, video clips, prompted conversations, current school topics, etc. to promote conversation. When students move from just asking or answering textbook questions about a topic to engaging in interactive, highly responsive conversations through other conversation prompting tools, they improve their speaking. 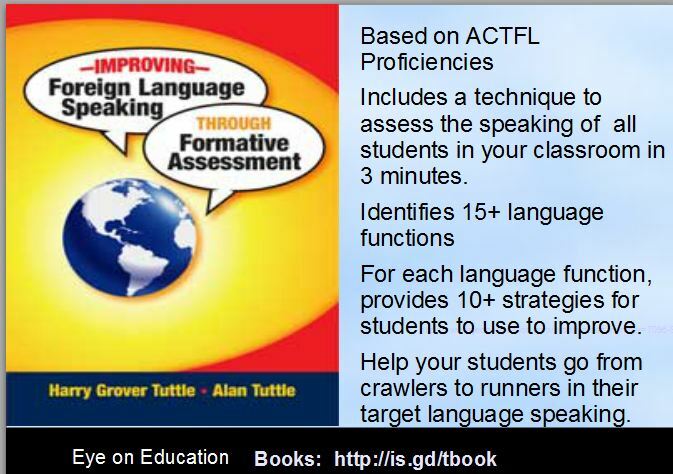 Do you use your modern language textbook as the only tool or as a tool? Do you have one resource, the textbook, or a variety of resources?